Purpose of this blog is to enable Common Man think about Big Picture of Economics. How we look today ..
Central Bank, IMF, Corporations, Paid Media, Human Development. To make it simple Inflation is what matters to Common man and poor people in particular. It Does not mean GDP growth is not important but Inflation is MOST IMPORTANT to him. We heard this “Loud and clear” on Largest Democracy Experiment on Planet earth. Although there were many other factors. To me this was MOST IMPORTANT Factor. The biggest challenge in front of government is of course to curb it. Based on my understanding there can be 3 phase approach to solve this mammoth challenge. Of course writing blog is much easier than running country but still this is good intentional thought process which may give something useful. So here is this 3 Phase Plan for economic revival of India in next 5 Years. Step 1) Understand the Big Picture and Problem. Before Going into solution let’s try to see how we got this Problem of High Inflation and how big it is... At country level there are 3 recipes of inflation. 3) Artificially Low Interest Rates. Interest rates have been always less than real inflation since 2009 when Inflation super cycle kicked off in India. Thanks to short term thinking of then FM Pranab Mukharjee and ever brilliant P Chidambaram. Typically it leads to one of the below roads..
1) Deflation First then Economic revival and Prosperity. 2) Hyperinflation and complete destruction of economy. This should be straight forward without any hesitation... Make Money. Although it’s always difficult to actually make it than said. Country like India however has lots of obvious options like Suggested by Subramanian Swamy. 4) India has whopping 21 Million NRIs... Offer one time 500 USD “Green Zone” pass to them that will remove Import restrictions from max 25000 INR to 500000 INR / NO Restriction. Anyways it’s a corruption paradise how much money government of India truly get is a big question. Even if 20% NRIs opt for it, it will be whooping 2 Billion USD... If all OPT it’s 10 Billion. (Frequent flyers can also opt for it.) Once done, cut the staff from that department & stop wasting money. 5) Indian Railways, and many other Organizations have massive land sitting Ideal. Give it for 99 Year Lease as long as there are no security / scalability issues involved. 6) Dis – Investment. PM Elect Mr. Modi once said “Government has no business to be in business” If he follows it lots of ever sick / even better managed Government companies can be sold resulting in huge cash. 7) Engage Japan, US, Germany, UK they have Money but no growth. We have huge growth potential but no money so its perfect partnership. How much money we need (Refer to chart above.) Total India need 254 Billion USD / year to balance so called twin deficits. Per capita its 205 USD / annum. Is it really easy? May be not but that’s where man with strong will power come into play. With his Powerful arm he can fill government treasury with money... During whole this time 6-9 Months Inflation won’t ease considerably. Communicate to people to be patient. They have seen 7 years of It 6 more months. However don’t reduce interest rates at all. Phase 2) Burst Real Estate bubble to kill inflation. 9- 18 Months. 9 Months – 15 Months this is where putting breaks should begin. It’s a Bitter pillow which we all have to swallow. Indian Economy has not seen recession since 2001. This is NOT A GOOD sign. Economy need cooling to curb inflation. There is massive monetary inflation out there led by “Artificial Real estate Bubble”. To curb the inflation India should take hard tone on Builder / Real Estate Infra Lobby. Companies like Unitech / DLF have been lobbying really hard with previous government. And just looking at it one can smell “2G like SCAM” which is not exposed yet. Expose it... STOP LOAN FORGIVENESS/ (RESTRUCTURING) to BUILDERS. And ask them to sell unsold flats at whatever rate and repay Loan ASAP!! If they don’t send them behind Bars. It may sound politically incorrect but country in which people die simply out of hunger every day Should have Capital punishments for Frauds of Big Quantum. Anyways - Will it create Bad assets in Banks YES…SO WHAT?? “THEY ARE BAD” More you delay worse it gets. Will it create scenario where people will repay more in terms of loans than market value YES… SO WHAT... Let these visionary Buyers understand that nation is built on Industries not by buying Homes and let them face burnt of Congress Decisions and propaganda. It’s not BJP who encouraged people to buy Homes. It’s Congress who created this massive Domestic Super Bubble. Expose it burst it... And believe it or not that is the root of Indian Inflation today. Will it create recession Yes SO WHAT?? Recession is like wild fire and is absolute must for long term economic revival. It will create world is coming to an end scenario but once all mal investment gets purged, “People’s trust in currency is restored and right message is sent” then economy will grow at unprecedented rate. Remember People love bitter truth than sweet lie. India has shown that it’s not bagger’s country who will vote for free food and free money. They know there is something wrong there in Real Estate. Expose it communicate it well. With its demographics, visionary leaders like Mr. Modi, Economy will bounce back like phoenix bird and it may experience Export led 12 – 20 % Growth (Without Inflation) for few years provided Deficit is completely avoided. All aggressive plans of Bullet train, becoming world leader in Food export can be realized in this. 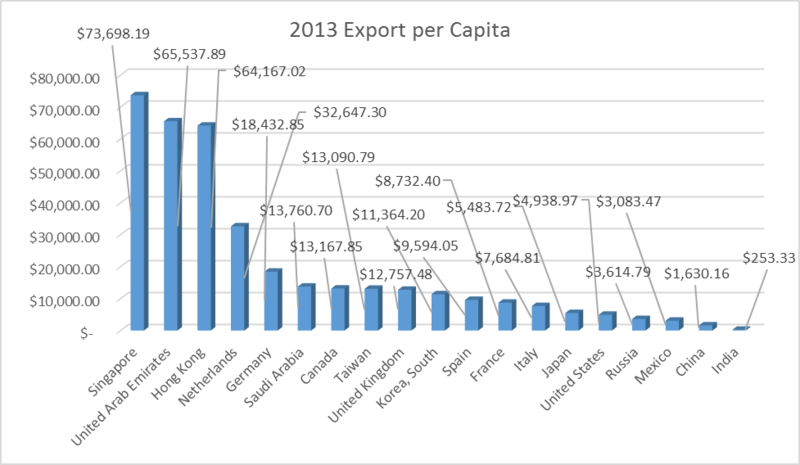 Just look at Export / Capita of Top 20 Export countries. India has a Huge Potential to double / triple its export in 5 years which should change the picture completely. Also Remember Global inflation has not yet kicked off once that kick off and if India has passed the Recession India may very well get massive investment inflow on markets as well as currency. Anyways timing is always a speculation but I guess focus on inflation and curb it in whatever way is absolute must! With 3 years of amazing growth post-recession, Government should find it easy to get re- elected and maintain growth of economy for another few years. Its Official!! Central Bankers have "Bubble Blindness." Helen Keller once said.."The only thing worse than being blind is having sight but no vision" Therotically there can be something even worse and of course its "Neither sight not Vision". As far as bubbles are concerned i think Central Bankers are in that category. They may be the best Scholars of their time. Highest marks in academic career. May have written big books that no one understand.. But bubbles which are infact unclaimed childs of Central Banking policies can never be seen by them ..Hence they can be safely placed in "Neither Sight Nor Vision" category atleast for Bubbles..
Last week India's central Bank Governor Subba Rao claimed that there is no Housing Bubble in India. Prices have surged up by 1000%. In few cities and the whole mania has exact bubble characteristics. But this dude don't See it... He has no clue that When it bursts how sloppy his statement and how idiot he will look. This may sound rude but it's my honest opinion and I guess I have full rights to express same. Story of Indian Rupee in his Own words. Why is Alexander The Great's Greece "not allowed to Default"